Ahhh, yes. 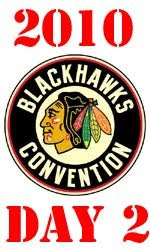 The second day of the Blackhawks Convention. Hockey in July–even if it’s not actually being played. Shellie and I showed up to the Convention Hall just before 9 am, in hopes of getting former ‘Hawks player and current ‘Hawks General Manager Dale Tallon‘s autograph. But due to the poor organization, we were not allowed into the autograph area until 9:25. Several hundred people–who took a side entrance into the venue–were allowed to “cut” in front of us fans who were waiting in the line we were told to wait in. This sort of thing happens in conventions a lot. Just ask anyone who’s gone to Wizard World or Comic-Con or the Star Wars Celebration. After perusing the merchandise tables, we went to catch the tail-end of a panel discussion that featured team owner Rocky Wirtz, team President John McDunnough…and GM Dale Tallon. Shellie suggested that I try “stalking”–something I usually don’t do. But I really wanted to get this 1972 Team Canada puck signed. So, it was worth a try. As soon as the conference ended, I made a beeline for the stage. Tallon begrudgingly signed for a few people, as his “handlers” repeatedly told us that he had some place to go. I said “Hey Dale, you gotta love this puck”, and he took my silver marker and signed the puck. While I am thankful that he signed this for me, I miss his autograph of yesteryear. Tallon used to do an “every letter” signature, signing an autograph like someone signs a check. That’s not the case anymore. But I was happy. 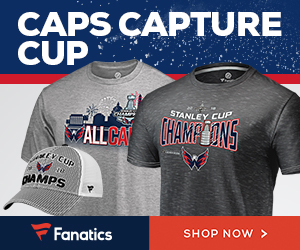 A win is a win…even if it happens in the shootout! Next up we headed back to the autograph room. 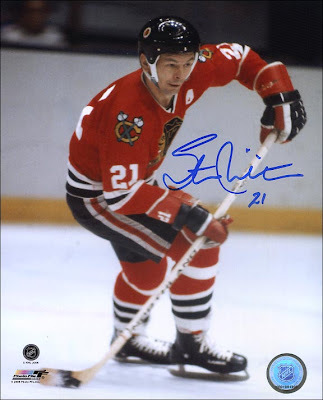 Shellie went in line to get Eric Daze‘s autograph on an 8″ by 10″ photograph, while I waited in line for Dennis Hull. The line for Daze was not really long, and moved rather quickly. The Daze photo will be for my sister, as he was her favorite player from the past decade. Shellie patiently waited–and knitted a sock–while I stood in line for Dennis Hull’s autograph. I had another 1972 Team Canada puck with his photo on it. One goal of mine was to get these two Team Canada pucks signed. Hull was very talkative and friendly. He asked me if I knew where this puck came from. When I told him I did not, he told me that they came packaged with a bottle of Bacardi Rum in Canada. He also told me the tale of one fan who had to buy 50 bottles of rum to get the Dennis Hull puck, since you didn’t know which one you got until you opened up the box. Hull is a funny guy, and I really wish I could have gotten a few more things signed by him. At this point, Shellie and I decided to get lunch, and then head back to the dealer room. While going through some cards at a dealer table, the dealer looked at me, pointed to someone nearby and said “You got a Steve Dubinsky card with you? ‘Cuz that’s Steve Dubinsky.” Silly question. Of course I had *several* Dubinsky cards with me. I came prepared! I got four cards signed by Dubinsky, and he commented on the card of him with the Indianapolis Ice, saying how cool those uniforms were. After getting those two Team Canada pucks signed, my next goal was to get Bria Campbell‘s autograph. We headed back to the autograph area for round three of the “cattle call”. Along the way, we ran into Steve Konroyd, who was walking about, signing things for fans. I got four cards signed by the former ‘Hawks defenseman, and Shellie got one other card signed for me too. Konroyd happily pointed out his rookie card, mentioning that it was from 27 years ago. I also got to share one of my favorite “Steve Konroyd” memories with him, when he was with the Chicago Wolves. Probably not a highlight for Konroyd (his season with the Wolves), because his response was “You remember me with the Wolves? You must have been very young.” I told him I was twenty at the time. Oh well. Brian Campbell signing autographs at the Blackhawks Convention. The girlfriend and I got into the line for Campbell at 4:30. Campbell showed up a few minutes before 5:15. At around 5:45, we were up. I got one 8″ x 10″ photo signed–the limit was, after all, one autograph per person. But Shellie, being a cute girl and all, struck up a short conversation with Campbell as she nonchalantly put forth an 8″ x 10″ and a hockey card. Campbell signed both, as they briefly exchanged notions of Chicago having the best restaurants of any city. Overall, Campbell was relaxed and friendly. This upped my autograph count to seventeen, but I wasn’t done yet! 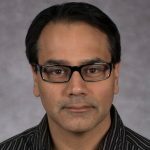 At 6:00, there was a panel discussion about the 1992 Blackhawks–the year that the ‘Hawks lost to the Pittsburgh Penguins in the Stanley Cup Finals. The panel consisted of Pat Foley, Steve Larmer, Brian Noonan and Steve Konroyd (who was actually with the Hartford Whalers at the time, go figure). This was awesome! I wish I could remember everything that was said. Things mentioned during that hour ranged from Mike Keenan being a hard man to work for (duh! ), to their thoughts on who was better–Ed Belfour or Dominik Hasek. Hell, Steve Larmer laughed–a lot! In all his years of playing, I never saw Steve Larmer even smile. That alone was worth it for me. 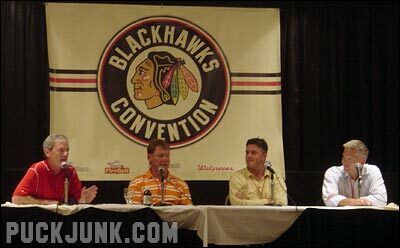 Left to right: Blackhawks Play-By-Play Announcer Pat Foley along with retired Blackhawks Steve Larmer, Brian Noonan and Steve Konroyd. 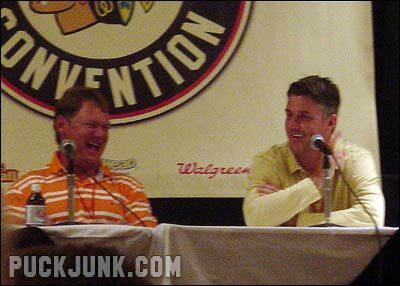 Steve Larmer and Brian Noonan share a laugh when reminiscing about their playing days. At the end of the panel, fans rushed up to the stage to get autographs. Shellie got there quick (I hate to be a “pushy guy”…but girls and kids don’t seem pushy if they quickly move to get an autograph). Steve Larmer signed a jersey for a kid, an 8″ x 10″ photo for Shellie, then turned and walked out. Brian Noonan, on the other hand, was a bit more amicable, as he signed an 8″ x 10″ photo and two cards for me. 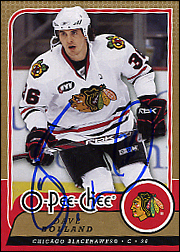 He really seemed to dig the card of him from his days with the minor-league Saginaw Hawks. He also signed a card for Shellie. This brought up my in-person autograph count to 22–not a bad day for an autograph collector, eh? 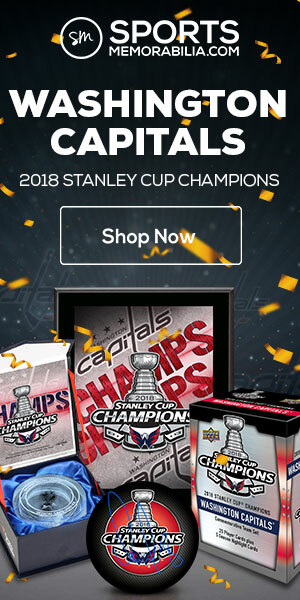 I am going to try to get tickets to the Winter Classic. I have bought into the hype.